They like their beers big at Dainton. Or, according to the tasting notes for the Big Bad Bourbon, mad and stupid as well. It's a beer that sits comfortably in the "massive" category, a bourbon barrel aged rye Belgian barley wine weighing in at 14 percent ABV that's as much of a mouthful to drink as it is in name. Once its fizzy head has dissipated, you'll find a sweet, sweet liquid in your glass – toffee, raisins, rummy booze – and one that's packing some heat too, making it an after dinner sipper for those with sturdy palates. 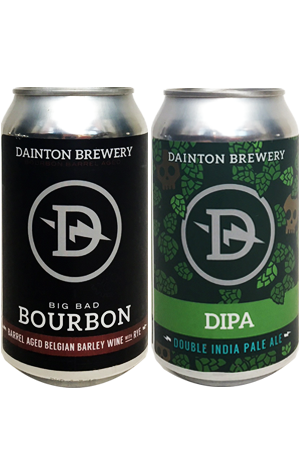 Less massive in size but no less crammed with intent is the Double IPA, brewed in honour of Dainton's near neighbour, Nat Reeves of KAIJU! It's a battle between stewed fruit like hops and chewy malts, one that takes place against a backdrop formed by a suitably Nat-esque bitterness.